One Capital Of Culture To Be Linked With Another!!! NEW Irish based airline Jetmagic have announced plans to commence a scheduled service linking the 2005 European Capital of Culture � Cork, with the 2008 winner, Liverpool. Jetmagic have been considering flights to Liverpool for some time but Wednesday�s announcement convinced the airline about the need to operate a route from Ireland�s second City to the future European Capital of Culture. Flights are due to start between the two cities on 15th September 2003 and will operate twice daily on weekdays with prices starting at approx �150 return (approximately �107 excluding taxes). The airline will use modern 37 seat Embraer 135 regional jet aircraft, which will give a flight time between Liverpool and Cork of only 55 minutes. Flights depart at 10:30 and 21:20 giving passengers travelling on a day return plenty of time in either city. The airline is a new company which started operating from Cork to five cities on 28 April 2003. They operate a ticketless airline with bookings made via their website www.jetmagic.com and aim to offer value for money, fuss free travel. Check-in is available up to 20 minutes before departure, return flight check-in is available on the outward journey to save time and complimentary wine / soft drink is served on all flights as one of the airline�s �little touches� to make flying with them something to enjoy. Jetmagic have also launched services to Edinburgh and Paris from Cork at the same time. Patrick Rafftery the airline�s CEO said, �We are particularly pleased to be announcing direct, double daily services to Liverpool from Cork at a time when Liverpool has just been chosen as the European Capital of Culture 2008. 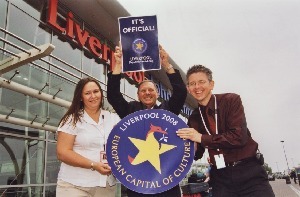 Jetmagic is delighted to link the 2005 Capital of Culture with the 2008 Capital and I am confident this tremendous boost for Liverpool as a City will also be good news for airlines such as ourselves flying to Liverpool John Lennon Airport�. Neil Pakey, the Airport�s Managing Director added, �This is tremendous news. Jetmagic�s decision to serve Liverpool confirms much of what has been said about the wider impact of last week�s Capital of Culture victory. Chris Brown, Director of Operations at the Mersey Partnership said:- "Cork, Capital of Culture in 2005, was one of the very first cities last week to send its congratulations to Liverpool and we look forward to welcoming many new visitors from Ireland. The predicted growth in tourism visitors will be boosted by the addition of future new routes like this from Liverpool John Lennon Airport." Photographs and report with thanks to J.L.A. Visitors to the Mersey River Festival this coming weekend are being urged to leave their cars at home and travel into Liverpool by bus, train or ferry. More than 300,000 people are expected to attend the event - which is now into its 23rd year, and will be a key part of Liverpool's European Capital of Culture celebrations in 2008. � Drivers are also asked to note that between 11am & 4pm on Saturday and Sunday the road into the Albert Dock will be closed at the main gates to minimise congestion. The 23rd annual Mersey River Festival begins on Friday June 13th and finishes on Monday, 16th June. The first of the visiting tall ships, including Grand Turk, are now berthed. Report with thanks to Liverpool C.C.